Last night the oven caught fire. I’d only popped out for a while and left Bee a lasagne to heat for supper. We’ve had it for about 13 years, and it has seen two replacement heating elements and a couple of glass doors which shattered for no obvious reason. It also has always sounded like a derailing freight-train since we bought it, so perhaps it’s time for a new one. The central heating part of the boiler, which now is being called into service after it’s summer holiday has decided it also has had enough. Even that has had so many parts replaced I’m not sure if it’s the same boiler we started with. And finally, to complete the trinity, the brakes on Bee’s car failed as well. It’s been a good week for the repair industry. Back in the kitchen, all is not lost without an oven. I’m baking bread in my neighbour, Russel’s one, which has its own peculiarities. It’s rather like the peasant taking his loaf to the village bakery to be cooked. I can’t, however, impose full roasting usage upon him every evening. So it’s pots and pan cookery for the immediate future. Fortunately, the season is perfect for slow cooking. A strong, heavy deep pot, preferably cast iron and with a lid is a kitchen essential. You can make meals with just one burner and fill up on hearty and healthy food. I’m buy our meat from Heal Farm in Devon and the quality is amazing. Knowing where it comes from and being able to speak directly to the farmers is a privilege. It’s not much more expensive than the supermarkets and the little extra it costs is, in my opinion a price worth paying for the quality and care. 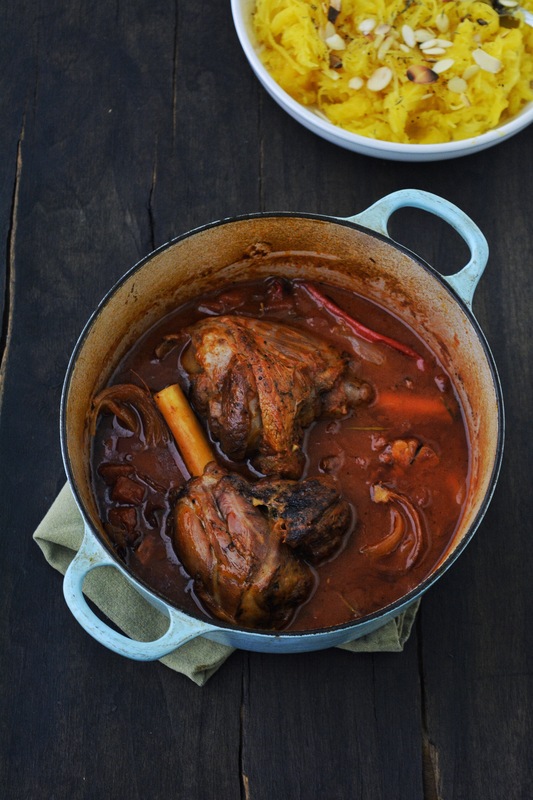 These lamb shanks were so rich and flavoursome. A proper autumn meal, and very easy to cook using one pan. Fortunately, I roast the squash earlier in the day so it only required a quick warming through. You, with your fancy, functioning oven should be fine to cook it as normal. If you can’t find spaghetti squash, swap it for pumpkin or sweet potato mash with thyme and almonds. This is a rich and meaty meal. A proper dish if you’ve just been out hewing logs or something. And one that, after a few minutes preparation, pretty much cooks itself. It’s also perfect for the slow cooker if you have one. Eight hours on low should do it. Season the lamb shanks with salt and pepper then brown them all over in a little oil in a very hot pan. Deglaze the pan with about a mug-full of water and add the lamb and liquid to a heavy, lidded casserole dish. Add all the remaining ingredients and cook for about two and a half hours on a low flame. It’s even better if you cook this the day before you need it. It tastes just a little more rounded after a good rest. For the spaghetti squash, roast it for one hour in the oven at about 180c. Leave it to cool a little, so it doesn’t steam your face off when you cut into it. Scoop out all the flesh. Sprinkle over some thyme and almond flakes and a little seasoning and serve with the lamb and sauce.